Time to give our navigation list some style! 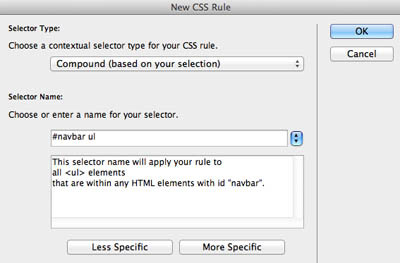 Before we get into the step by step process, we need to take a look at the tag structure of our navigation list. 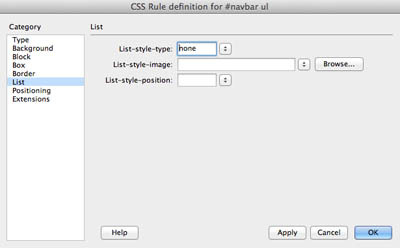 There are three elements or tags we will need to style to create the look we want for the navigation menu. We've already seen what the tag structure for a list looks like, but we've added a link to each list item, which adds the <a> tag to our navigation list. 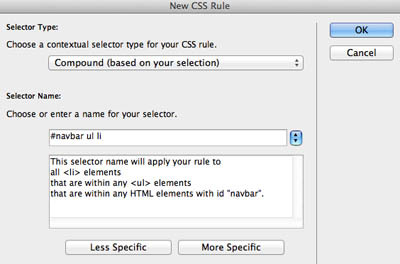 In the Selector Name box, you should see "#wrapper #navbar ul"
In the List-style_type drop down menu, select "none"
For the <li> tag, we are going to style the list so it displayed horizontally instead of vertically. In the early days of HTML and CSS, there wasn't a way to position tags next to each other on the same horizontal plane – HTML was only designed to display tags vertically, one on top of another. This is because web browses parse a page from top to bottom. 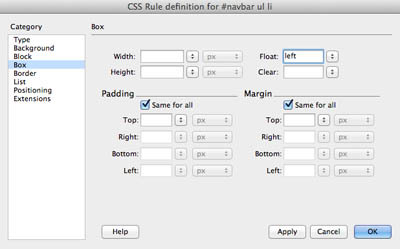 In the Selector Name box, you should see "#wrapper #navbar ul li"
In the Float drop down menu, select "left"
In the next exercise, you will style the links to finish up the navigation menu.